Rahm Emanuel Strikes Out in Chicago, Or Does He? Three hundred fifty thousand public school students finally returned to their classrooms last Wednesday when the Chicago Teachers Union, on strike for nearly two weeks, agreed to leave the picket lines and accept the terms of a new contract. Faced with Chicago’s first teachers’ strike in 25 years, Mayor Rahm Emanuel desperately tried to spin the contract as a victory. However, the final negotiations did little more than slap a Band-Aid over a festering sore: Chicago’s failing public school system and the lack of funds to finance it. In a television ad costing $1 million, Emanuel informed Chicagoans that the contract was “the right deal for our kids” and highlighted several of its “achievements:” a full school day, freedom for principals to hire teachers, and teacher evaluations based partly on student performance. However, he failed to mention that the school system agreed to award the teachers a 17.6 percent pay raise over the next four years, and he offered no answers for how they planned to finance such a pay raise. The school system already faces a $1 billion budget deficit for fiscal 2014. But even if such a pay raise could be financed, would it fix the system? That seems unlikely. 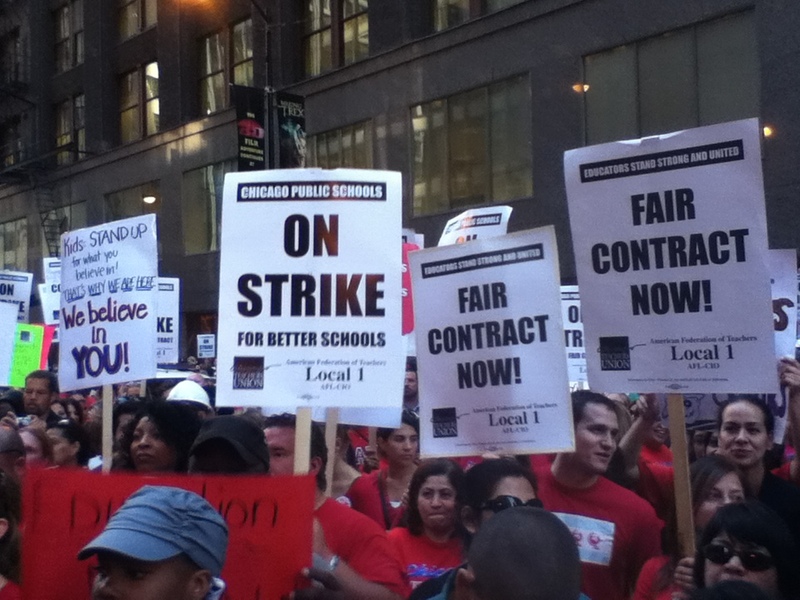 Prior to the strike, Chicago public school teachers earned an average salary without benefits of $76,000. This ranked as one of the highest average salaries for public school teachers of any United States city. And, yet, Chicago public schools have a 40 percent dropout rate. According to the U.S. Department of Education, 79 percent of eighth graders did not measure up to grade-level reading standards. Eighty percent were not at grade-level standards in math. Forty percent of Chicago public school teachers indicated their lack of confidence in the public schools by refusing to send their own children to the schools where they taught, enrolling them in private schools instead. However, there is some good news in the Chicago education system. The fifty thousand students enrolled in charter schools remained in classes during the strike because these schools hire non-union teachers. Unlike the public school teachers, the charter school teachers are paid based on their performance. These teachers do not receive life tenure or the kind of job protection that public school teachers do. The annual average salary at a charter school in Chicago is $48,910. But unlike the public schools’ 54 percent graduation rate, charter schools have a 76 percent graduation rate. The charter school model is a growing threat to public schools, especially as more students leave public schools to attend charter schools, and consequently divert government aid that is tied to enrollment numbers. Public school teachers, beginning to feel the pressure of being compared to the charter school model, lashed out at Emanuel for favoring charter schools, pointing out his call for the creation of sixty new charter schools by 2017. They argued that he is seeking to close hundreds of public schools and privatize their jobs. Emanuel denies such claims. With the presidential elections approaching in November, he decided it was best to back down and capitulate to the union’s demands. He probably did not want to anger the unions and jeopardize the Democratic presidential ticket. Instead, he chose to bargain with the teachers' union and wound up agreeing to terms that may eventually bankrupt the entire Chicago public school system. But perhaps Emanuel’s capitulation to the teachers union is a blessing in disguise. In addition to paying for the strike deal, the Chicago public school will have to allocate $338 million to pension payments in 2014. Thus, despite Emanuel’s statements to the contrary, the cost of these higher salaries may force him to close many public schools anyway, leaving hundreds of union teachers without jobs. Public dissent against the teachers union may also grow as the exorbitant salaries are funded through higher taxes, especially as Chicagoans see their own salaries decreasing during America’s troubled economic times. As the city’s budget is squeezed, Chicagoans will galvanize to reform their public school system, taking steps that will truly be the right deal for Chicago’s kids. These steps must involve dismantling the union that protects incompetent teachers from being fired and offers them little incentive to truly put the interests of the children first. Automatic salary increases must end and a competitive system introduced in which teachers are only rewarded when students’ test scores start rising. The strike deal on Wednesday was merely the calm before a storm that will radically change the face of public education. Nicole Bianchi is a senior Politics, Philosophy & Economics major. She is a freelance web designer and the founder of a writing tutoring business in New York where she teaches weekly writing classes to homeschool and private school students. Nicole is the opinion editor and webmaster at The Empire State Tribune.